Adding pre-test questions is simple and results details such as maximum force, average force, elapsed time, limit force and peak force can be set to display in the live graph. Test results are presented in a spreadsheet format allowing you to analyze data and perform common mathematical and statistical calculations. Results can be exported to Excel. Graphs and test results can also be exported directly to PDF and Word formats. The ForceTest software is Windows based and operates using the latest Windows 8 and 10 operating systems. 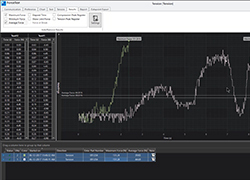 The ForceTest software is compatible with the Chatillon DFS II Series and the previous generation of the DFS I Series replacing the NEXYGEN DF software. This allows users of older models to upgrade their force gauges at a low cost. The ForceTest software comes FREE OF CHARGE when buying a DFS II Series digital force gauge. Software Version 1.0.2 07-Aug-18. Added Features: 1) Customize line color, 2) Warning message now alerts if the DF I or II Series gauge needs power cycling, 3) Live readings and graph values now match the polarity of the gauge. Fixed: 1) Standard Tests no longer disappear when connecting with a remote non-dedicated force gauge, 2) Zooming in during a live run has been improved, 3) Fixed the date and time data in the "Started On" column, 4) Fixed crashing issue when connecting via RS232, 5) Fixed crashing issue when test limits are sent from a gauge, 6) Statistics can be calculated for all or just selected tests, 7) Responses to PreTest Questions are now correctly displayed on reports. Software Version 1.0.1 12-Dec-17. Initial Release.